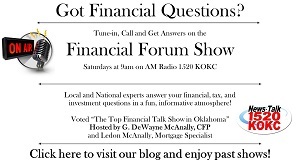 G. DeWayne McAnally, CFP, and The Advisory Group have been serving Oklahomans since 1978 with the aid of Grant R. Milner, AWMA (Accredited Wealth Management Adviser) and other professionals on The Advisory Board. These Professionals advise clients in all areas of the Financial Arena. They specialize in charting your future financial course using management of Investments, 401K Rollovers, IRAs, IRA Rollovers, Retirement, Financial Planning, Estate Planning, Insurance, Educational Funding, or any other financial areas that are important to you. Managed Investment Funds, 401K Rollovers, IRA Rollovers, IRAs, Mutual Funds, Annuities, Stocks, Bonds and other investments offered are not insured by the FINRA, SIPC nor are they obligations of or guaranteed by G. DeWayne McAnally LLC. Such investments will fluctuate in value and are subject to investment risks including loss of principal. Before proceeding further, please be advised that at present Mr. McAnally is licensed to discuss with and/or offer financial advice to residents of OK and TX. If you are a resident of any other state, please check with Mr. McAnally to see if he already works with Clients in your state. Note that it is a simple and expeditious procedure for Mr. McAnally to become licensed in other states. G. DeWayne McAnally LLC, is an Independent Registered Investment Adviser.